This journal explores the local, national, transnational, and hemispheric realities that influence the Latina and Latino presence in the United States. Latino Studies presents an international research agenda that builds bridges between the academic and non-academic worlds, and promotes mutual learning and collaboration among all the Latino national groups. In addition to full-length original research articles from scholars and practitioners, Latino Studies publishes shorter ‘Reports from the Field’ that describe and analyze significant local issues, struggles and debates affecting the lives of Latinas and Latinos. The journal also offers many book and media reviews, which focus the view of scholarship on the experience of Latinas and Latinos in the United States. Another important feature of the journal is the páginas recuperadas section. These 'recovered pages' cast a scholarly spotlight on historically significant achievements by individuals, and pivotal events in Latino and Latina culture in the United States. 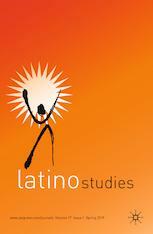 Latino Studies brings a blend of scholarly rigor and human dignity to the experience and struggles of Latinas and Latinos for equality, representation, and social justice. Spanish is not spoken here!